Last time we had talked about how to complete a keyword research in less than 60 minutes. Today, it’s time to dig a bit deeper into keyword research – one aspect to be specific – local keyword research. Today we are going to discuss how to approach keyword research for a local business client. The Evolving Search Engine: With the introduction of artificial intelligence in search engines, we are now in the Age of Jarvis (a.k.a Google Brain). Everything from our actions, choices and preferences act as identifiers of our behavior and search trends for these AIs and search engines. They are coming up with progressively complex algorithms that will minimize human interventions further while enriching the user experience. The Local Data Aggregators: Today, Google or Bing are not the only source of local information about businesses. In fact, search engines have been found to have sourced the data from other third-party data aggregator websites which collate this type of information. Companies like Foursquare are at the frontier of developing layered local user experience – adding layers of user generated content (like reviews) on top of the business location and related information. As the popularity of such aggregators keeps soaring, so will the search engines’ and other local listing sites' (Yelp, etc.) dependency to source data from them. The Mobile Apps: Stop reading this for a second and look at the list of apps on your mobile phone. Start counting the apps you have installed that have access to your location data. You will be surprised to see that almost all of them ask for access to our GPS information – to pin point our location. From Uber to Tinder, and everything in between – they all know exactly where we are at any point of time. And these apps use this information to serve users better with more location-relevant information. 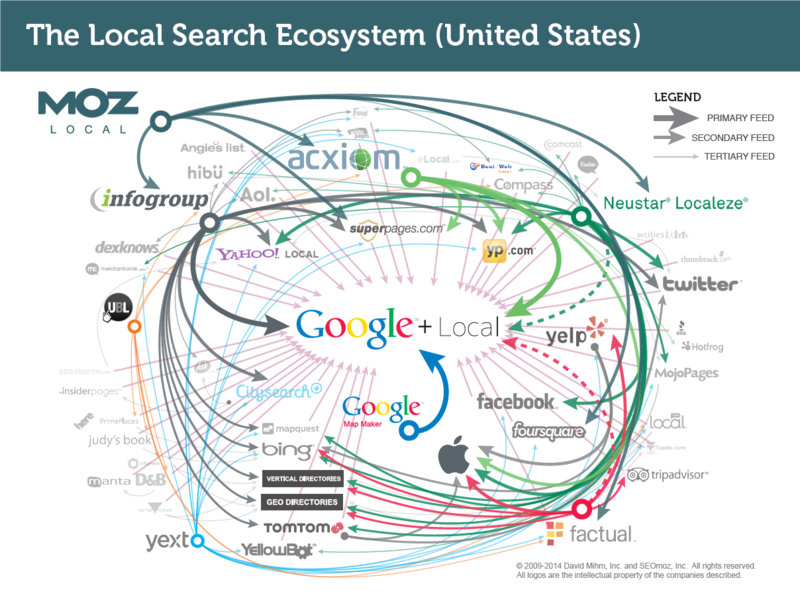 This in itself is a game-changer when it comes to local searches. The Social Media: This is a no-brainer! And has been written about enough times. Social media has found a way to seamlessly integrate a user’s location information into its algorithms to provide a customized social experience to the user that is venue-specific in nature, increasing its relevance. From Facebook to Twitter to Instagram. Every social media platform now uses your location information in one way or the other. What's more, these are helping businesses connect with their local audience in a much more effective and social way. With so many things coming into play, it can sometimes be overwhelming to conduct a keyword research for a local business. Find out the locations where the client serves. This is the most crucial step. You can have the client fill a questionnaire to get this information. Collect and prepare this list of locations. Get it verified from the client. Find out the different regions and sub-regions where the local business serves. These can be categorized as regions like states, counties, cities, suburbs, etc. The idea is to go hyper-local if required from a local client's perspective. Find out what are the services (E.g. plumbing, roofing, legal, accommodation, etc.) or products (E.g. cakes, perishable goods, flowers, apartments for sale, etc.) that your client has to offer in these locations. Find out what are the pain points of the users that the client addresses. List down these pain points as well. For example, if your client is a plumber, a pain-point-specific search term would be "plumbers near me to fix leaking pipe". Google Maps - A quick local-modifier-based search of the client's service on Google Maps (or simply Google search) will give you a list of the top local businesses that are offering the same service in the same area. Ergo, competitors. Ask Siri, Google Assistant or Cortana - Not unlike Tony Stark's Jarvis, we have our very own virtual AIssistants - be it Apple's Siri, Microsoft's Cortana or Google's very own (and my personal favourite) the Google Assistants that now do everything from us - from scheduling our meetings, to tracking our daily commute. And much more. These can be good sources to "ask" for information. Try asking for services relevant to your client and collect any unique listing you notice. Remove duplicate competitor websites to filder down to the true top competitors of your client. SEO elements on the competitor websites - titles, meta tags, headers, content, etc. A good idea would be to run all competitor websites through a crawler, like screaming frog. Anchor texts of the competitors' baclinks - run a backlink research of the competitors using Moz or SEMRush and collect for location specific anchor texts. Competitor blogs and releases - look for location specific blog ideas and identify 4-8 keywords from the blog that can be utilized by you. This is especially great for when you need to create a content marketing strategy that's aligned with the local search based optimization of the website. Going back to the point I made earlier in the blog about the GPS tracking, users searching online know their location is being tracked by their devices. When searching for a location specific service (let's say thai restaurants) the user today doesn't even have to mention their current location. A simple "thai restaurants near me" will do. Collect and collate all the keywords you have listed down during the steps #1 to #3. Remove duplicates and misspellings (if any). Find out the monthly avg. search volume, Moz keyword difficulty score and current ranking of the each of the remaining keywords. Based on how they fair on these parameters, select the final keywords to target. To learn more about picking out the right keywords, check out Step3: Select Effective Keywords here. Truth: Not necessarily. Even though local keywords may have little or no search volumes, these keywords (which sometimes tend to be long-tail keywords too) are high on intent and have a better chance of conversion compared to a more generic one. And... Cut! That's it. Your keywords are ready for review by the client. Now for the second part of my giveaway - the local keyword combination generator. This simple yet efficient tool is going to help cut down your keyword research time by more than 35%. To know more, download the tool.